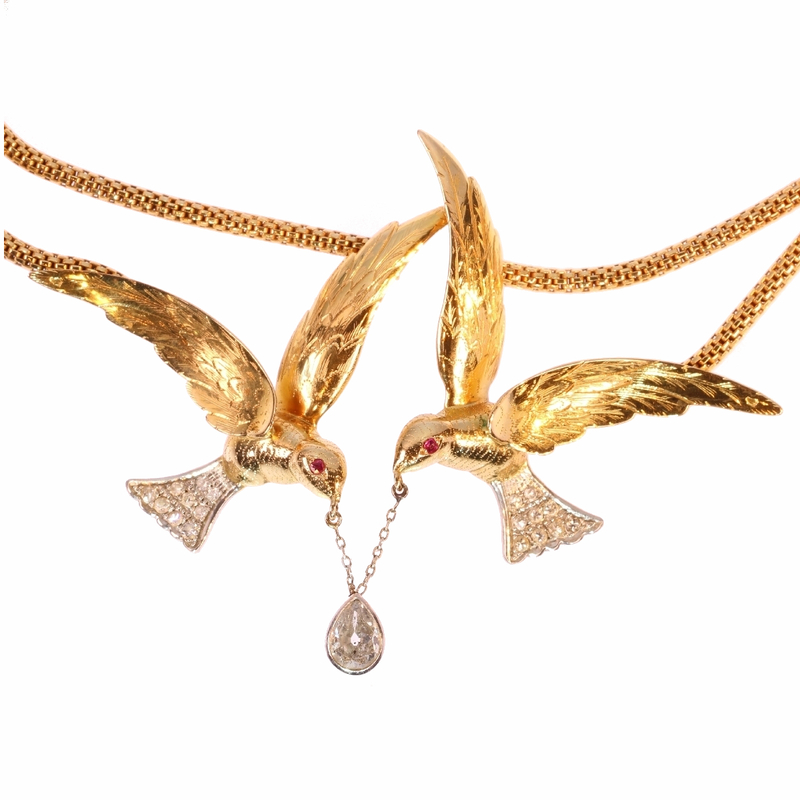 French Fifties necklace with two flying swallows carrying a pear shaped diamond: Description by Adin Antique Jewelry. Style specifics: This type of jewelry is very specific for the fifties of the twentieth century. All sorts of animals were used as source of inspiration for the goldsmiths. Made in gold and decorated with enamel and precious stones, the result of their labour most of the times well-made, clever and cute. Theme: Swallow - Swallows symbolize the incarnation of Christ, or also His resurrection because of their arrival in spring. There are nonetheless also regional differences regarding their meaning. Swallow nests can mean joy, marriages and children, while in Japan swallows symbolize infidelity because supposedly they change partners very often. Diamond(s): One old European pear shaped cut diamond with an estimated weight of ± 0.60ct. (colour and clarity: K, i). 28 old brilliant cut with an estimated weight of ± 1.00ct. (colour and clarity: H/K, si). Total diamond weight: approx. 1.60 crt. Precious stones: One rubies with an estimated weight of ± 0.04ct. Hallmarks: The French control mark for 18K gold representing an eagle's head (that was in use in France from about 1838) and the French control mark for platinum representing a dog's head (that was in use in France from about 1912).